“Do we wring our hands in despair and wonder how we’ll ever survive in such a world? No. Indeed, we have in our lives the gospel of Jesus Christ, and we know that morality is not passé, that our conscience is there to guide us, and that we are responsible for our actions. A few years ago, I was challenged to go for one week where every time I had a thought pop into my mind I was to first ask myself if it would harm anyone and assuming the answer was no, I was to follow it immediately. I learned so much from that experience about how the spirit speaks to me. Most importantly, though, I learned that the spirit prompts me every day, many times a day if I will just listen. Since becoming a mother, I have felt that guidance even more strongly in my life. Thanks, Stephanie, for uplifting me this evening by inspiring me to read this talk! I was just thinking today about what to do with all the thoughts that pop into my head, so thank you! I actually thought about keeping a notebook and recording them, and then recording what may have happened had I not followed that inspiration. I think I am going to take that challenge this week! From the title, I was expecting the talk to be about the importance of temples, yet it really wasn’t at all. Instead it was on the importance of personal prayer and inspiration. We live in a very wicked world, and it’s not getting any better as a whole. However, it is totally possible to feel peace and righteousness. I loved President Monson’s stories that he used as examples of how that works. I appreciated his challenge to learn how to communicate with our Heavenly Father. I’m grateful for a prophet who lives what he preaches. I was also reminded of something I read years ago when preparing a seminary lesson. President Harold B. Lee wrote a whole book on the subject of standing in holy places, but it was summarized in this statement “A holy place is any place where a man enjoys the Spirit.” (institute manual for D&C 87) I try to remember daily that wherever I’m standing can be a holy place if I have the Spirit with me – and that happens as we follow our prophet’s counsel to pray often. I alway love listening to Pres. Monson. He has such a wonderful way of making his points. What stood out most to me this time was the final story he relayed about his inspiration to announce Bro. Mourik as the first speaker even when he KNEW Bro. Mourik wasn’t there. It reminded me that we need to follow inspiration when it comes to us…even if it doesn’t make sense to us at the time. I think this is the main principle I am trying to teach my children right now. Following the Savior and keeping the commandments is the best assurance we have for finding joy and peace. It does not mean that we will have a life free from difficulty or disappiontment, but we can still have joy and peace in the midst of our trials. @Becky – I thought the same thing about the title! My favorite part was about not standing around wringing our hands worrying about how we are going to survive this “evil” world. I loved every bit of this talk. I loved that standing in holy places seems to mean listening and acting upon personal revelation. We just started talking about the 10 commandments for our FHE lessons this month. This just reaffirmed to me how important it is to teach these things to our children. Simple things like Thou shalt not steal, thou shalt not bear false witness, and thou shalt not kill are no longer being taught to so many children in this world (not even on a moral level, not necessarily a religious one). We must teach our children the values that we wish them to live, otherwise they will follow the worlds example and who knows where that will take them. I was very uplifted by reading this article. Pres. Monson said, “As we [pray], we will feel His Spirit in our lives, providing us the desire and courage to stand strong and firm in righteousness – to “stand…in holy places, and be not moved.” I like that – praying will give us the desire and courage to be and do what we are supposed to do. Love the talk by President Monson. Just this past week, I tried to stand in a holy place and help a child who was not. Difficult, but I am so grateful for the Holy Ghost and the peace and calm that was with me. 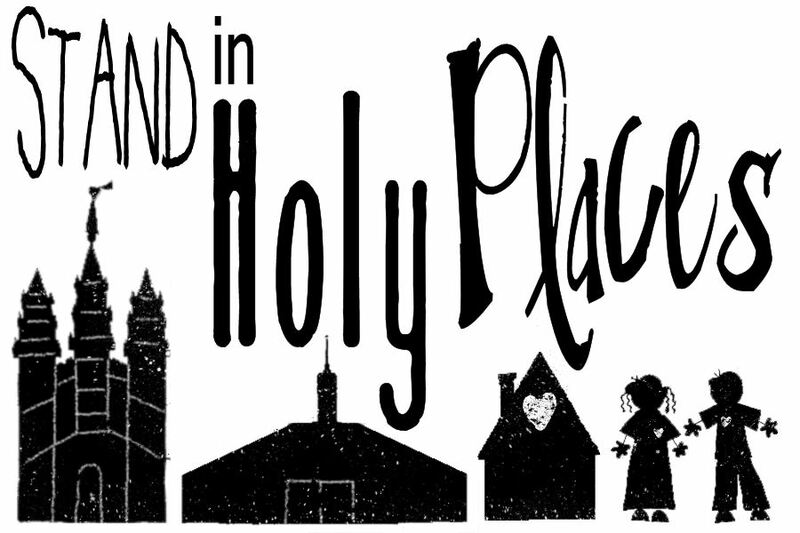 It’s funny how a holy place to stand didn’t concern me at all when I was younger – in my late teens and early twenties. It’s strange to think of how much I allowed the world to color my world and opinions. It’s strange now how little I can stand those places now and I how much I long to find the holy places now as my children grow older and make more of their own choices. I keep hoping they find their ways to holy places. Pray more = suffer less. There were so many inspirational ideas that stood out to me in the Prophet’s General Conference talk. 1. When we follow the Savior, live according to inspiration from the Spirit, and keep the commandments, joy and peace will be part of our lives. 2. The Holy Ghost cannot be with us during sinful or worldly activities. 3. To be in the world but not of the world, we need to pray. Heavenly Father wants us to pray so He can answer our prayers. 4. The world is a sinful place since the worldwide moral revolution of the 1960s. We don’t need to fall into despair about it. Instead, living the moral teachings in gospel of Jesus Christ and being guided by our conscious will allow us to live in the world safely. Everyone is responsible for their own actions and the laws of God, the Ten Commandments remain constant. “…there is nothing which can bring more joy into our lives or more peace to our souls than the Spirit which can come to us as we follow the Savior and keep the commandments.” We ought to memorize the ten commandments found in Exodus and the beatitudes found in Matthew plus we should study the scriptures and words of modern prophets. 5. This joy and peace doesn’t mean a life free from difficulty or disappointment, we will have trials. But those trials can be endured with joy and peace, while prayer will help us have the desire and courage live according to inspiration and God’s will for our lives. The more we pray the less we will suffer with our trials.